Shop Floor Automations (SFA), one of the largest independent CNC Automation Suppliers for the CNC Machine Tool Industry has released a new software product to run on portable PDA Units. 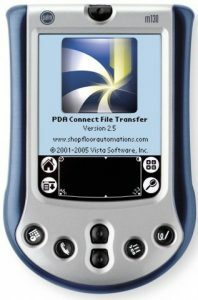 PDA Connect for Palm Pilots is an application that allows you to transfer files back and forth between most CNCs. Using standard XON/XOFF communication protocol, this simple to use interface allows you to backup or quickly load G-code programs. An unlimited number of machine templates can be used to store baud rates, data bits, stop bits and parity for different CNC controls. Edit programs within the unit for a quick change to a feed rate or any other G-code. PDA Connect also allows any file from your desktop computer to your PDA to be transferred. The transfer is binary, so an exact copy of the original file is stored on your handheld. Other uses for the software include backup of parameters, uploading files to CNC machines, collecting data from probes, or transferring files between remote computers! Unlike other software, there is no 4Kb limit on the file size, so you can copy large files to your handheld. Files remain in their native format after copying, so no special synchronization software is needed. The benefit to the software is ease of use, while using small portable PDA devices. The software is compatible with many units including PALM IIIe, m130, TX, T3 and more. For more information, contact our sales department.